2008 Cannes Film Festival "Best Director Award Winner" Turkish director Nuri Bilge Ceylan has turned his innovative talents to that old cinematic favourite, the crime thriller. When is a thriller, strictly speaking, a thriller? There's a fascinating cinema tradition in which directors associated with art films will take a stab at crime material. This lets them tackle the extremes of human experience without the taboos imposed by mainstream fiction; it can also let highbrow auteurs prove that they, too, can keep viewers on the edge of seats (as opposed to nodding off in them). The results have often been fascinating, if not always classifiable as thrillers. Luchino Visconti took on James M Cain's The Postman Always Rings Twice, in his 1943 film Ossessione: the result – unmistakably – worked as a genre thriller, but it was also a lot more, an acute psychological study and a founding text for Italian neo-realist cinema. But Almodovar doing Ruth Rendell in Live Flesh? Not remotely a thriller: the director is far more interested in making an Almodovar film. Such distinctions are ultimately subjective, so I'll leave you to decide whether Three Monkeys, by Turkish director Nuri Bilge Ceylan, is a thriller or an art film disguised as one. Either way, it offers an intriguing new angle on typical noir material, as well as a new perspective on Ceylan's style. This brilliant director made his international mark with the 2002 feature Uzak (Distant), about a disillusioned Istanbul photographer; his follow-up, Climates (2006), was a painfully intimate drama about a couple splitting up, all the more uncomfortable because the leads were played by Ceylan and his wife, Ebru Ceylan. 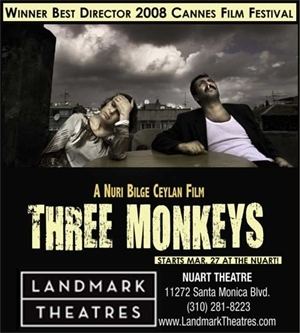 Three Monkeys retains the emotional concentration of Climates and the plasticity of time that Ceylan developed in Uzak. But this study of tensions between three family members and an outsider also tells a bracingly tawdry crime story, albeit in extremely pared-down fashion. The film begins with a middle-aged man driving at night, then running away from the scene of a hit-and-run. He is Servet, a politician standing in a Turkish election; he doesn't want his crime to endanger his chances, he tells his driver Eyup (Yavuz Bingol), and offers him a large sum of money to take the rap. Eyup accepts the deal in order to provide for his wife and son, then disappears into prison – and disappears temporarily from the film, for while we expect this to be Eyup's story (especially since Bingol is a well-known singer in Turkey), he's off-screen for the best part of an hour. Ceylan then leaves us to puzzle over what is happening in Eyup's absence. We learn that his teenage son Ismail (Rifat Sungar) is getting into bad company, but we don't know exactly what trouble he's getting into, any more than does his mother Hacer (Hatice Aslan). Early on, there's a long take of Servet carping on the phone about his thrashing in the polls: it is only after a while that Ceylan reveals that Hacer has been sitting opposite him, having to listen to all this. Given the churlishness of this unappealing bald pudgy man (played by one of the film's co-writers, Ercan Kesal), it comes as a surprise to learn, but only after some time, that Hacer has fallen for him. Three Monkeys is a sombre slow-burner, but with a thread of black comedy running throughout: the ringtone on Hacer's mobile phone starts off as a running gag, before you realise how much it foreshadows the bleak denouement. The intrigue coalesces into a murder story with a last-minute twist – a very sobering and ambivalent twist, at that. You may leave the film uncertain about what exactly has happened – or about which of the four characters are the three monkeys of the title, with its allusion to seeing, hearing, speaking no evil. But Ceylan withholds the answers: he'd rather you came out of the cinema and debated it, maybe over a strong Turkish coffee. The film displays Ceylan's trademark visual finesse: the close-ups linger on the characters' faces as their emotions shift, not always readably, while he applies his panoramic distortions not only to the cityscapes but also to the enclosure of the family flat. After using high-definition video for the fine-grained naturalism of Climates, Ceylan here puts it to very different use, shooting in colour but bleeding the image to metallic shades of grey. Decide for yourself whether Three Monkeys classifies as a genre thriller – but in terms of intelligence and cinematic invention, this tantalising film carries a thrill entirely its own.